A talented team of four teenagers from Dublin, Longford, Offaly and Tipperary have claimed the winning spot at the 2015 BT Young Scientist Business Bootcamp with their project entitled An Tionchar (The impact hurling boot). The group presented a mock pitch to a judging panel of business professionals, to compel the Leinster Council of the GAA to support a sponsored trial of the boot. Renuka Chintapalli aged 15 from Loreto Secondary School Balbriggan in Dublin, Mark Lyons aged 16 from Lanesboro Community College in Longford, Shiofra Ryan aged 16 from St. Brendan’s Community School in Offaly and Jack O’Meara aged 16 from St. Joseph’s College Borrisoleigh in Tipperary won ‘best overall team’ after impressing the judges with their business pitch for An Tionchar at the BT Business Bootcamp. The team was selected for its significant progress over the four-day workshop, which is designed to equip students with practical skills and knowledge that will show them how a creative idea can be transformed into a viable business proposition. Kate Duggan aged 15 from Coláiste Iognaid in Galway was recognised as the best individual student. This year, for the first time, the BT Young Scientist Business Bootcamp will be replicated in two additional territories, bringing the programme as far as the United Arab Emirates. BT will partner with the Khalifa University of Science, Technology and Research in Abu Dhabi to host the first international BT Business Bootcamp in April. 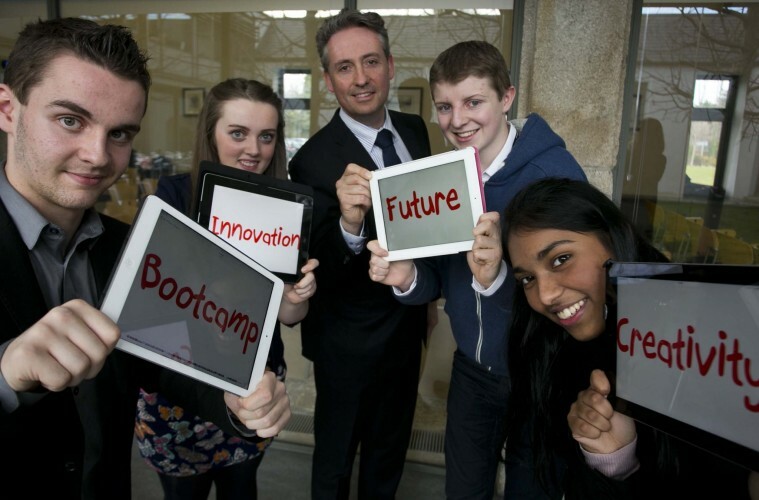 Closer to home, Queens University Belfast will host the first Northern Ireland BT Business Bootcamp later this year.